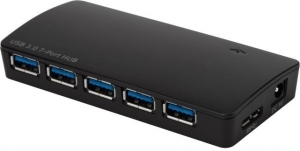 The Targus 7-Port USB3.0 Hub with Fast Charging turns 1 USB port into 7. Simply plug the hub into your computer’s USB3.0 port and enjoy a smooth connection and ultra-fast transfer speeds. USB3.0 provides transfer speeds up to 10 times faster than USB2.0. The Targus 7-Port USB3.0 Hub also features two Fast Charging ports that will charge your smartphones. It features overcurrent protection to prevent short circuits and electrical current overload.